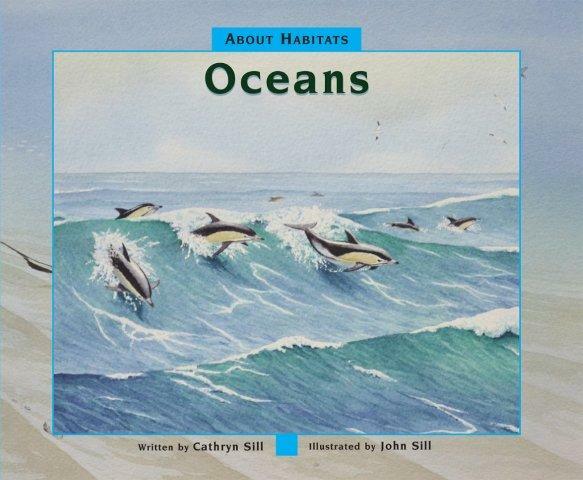 Once again Cathryn and John Sills team up to introduce children to ecological diversity. This time it’s a field trip into the oceans of the world. Oceans, they explain, cover most of the earth’s surface. And all those oceans are joined together. While Cathryn describes the variety of ocean bottom surfaces – flat and sandy, deep valleys, tall mountains – John illustrates the animals that live in those places: stingrays, scalloped hammerhead sharks, dolphins. The simple text is accompanied by detailed illustrations. For older readers the Sills have included six fact-filled pages at the back. That’s where you learn that Wandering Albatrosses have 11-foot wingspans, why Beluga Whales are called “sea canaries”, and that Giant Kelp can grow 24 inches in a single day. About Oceans is part of a series that explores deserts, wetlands and other habitats. Check out other books that celebrate nonfiction at Nonfiction Monday, hosted this week by Prose & Kahn. Review copy provided by the publishers. Molly Williams whips up hasty pudding, chicken roly-poly and johnnycakes for the volunteers of New York City’s Fire Company No. 11. But one wintry day, when snow covered the streets and flu had laid many of the volunteer firefighters low, church bells clanged out a fire alarm. Molly wrapped her shawl around he shoulders and headed outside to help any way she could. In 1818, New York City is still a small town. Volunteers and townspeople spill into the street to lend a hand battling the blaze. People toss leather buckets to the streets below for the “bucket brigade”. 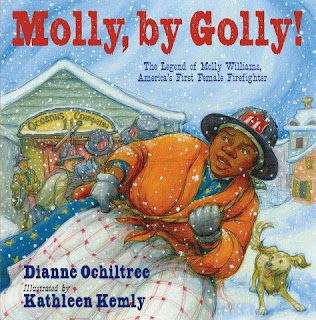 Molly jumps into action, helping push the pumper engine through snowdrifts, cranking the long pump handles, and pulling down bits of burning roof with a long iron hook. And, according to legend, became the first female firefighter in the United States. Though legend, there’s a lot of history in this book: info-packed back pages and historically accurate illustrations. This is a great book for any kid whose dad – or mom – is a volunteer on the local squad, and for anyone who thinks they want to drive a fire engine when they grow up. Every spring, hundreds of thousands of puffins make their way to the Westman Islands, off the south coast of Iceland. They build nests on the rocky cliffs, and spend the summer caring for their newly hatched chicks. By August, the young puffins – called pufflings – are ready to leave home and head out to the open sea. They fly off the cliffs at night and some, confused by the lights of town, flutter down onto the streets. Their wings are not strong enough to lift them off the streets, so children in the town give them a helping hand. Young members of the Puffling Patrol collect the confused birds and carry them to the shore to release. 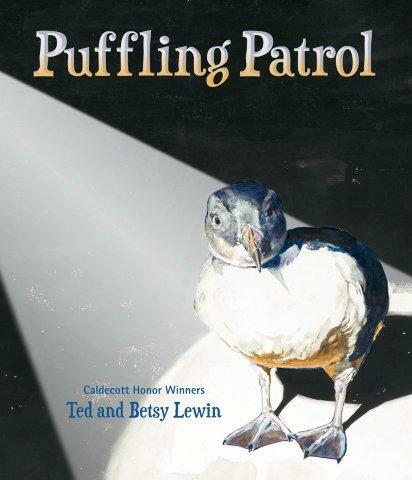 Ted and Betsy Lewin tell the story of two of the children in the Puffling Patrol, Dani and Erna. The eight-year old twins take their job seriously, collecting boxes and gathering flashlights. When it’s dark, at 10 pm, they head out into the rainy night. The next day the children take their pufflings to the museum to be measured and weighed. Only those strong enough to make it on their own are released. Finally Dani and Erna take their pufflings to the ocean. “The sea will be the puffins’ home for the next two years,” write the Lewins. “If all goes well, they will return to Heimaey as adults and raise their own chicks.” And when they do, the Puffling Patrol will be ready. Check out other books that celebrate nonfiction at Nonfiction Monday, hosted this week by Jean Little Library. 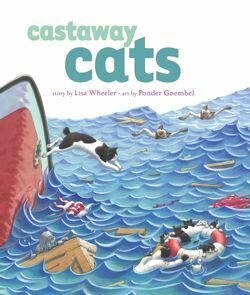 So begins Lisa Wheeler’s saga of shipwrecked cats – cats that, now stranded, must learn to sink or swim. Together. And that turns out to be as hard as … herding cats. The cats do not get along. They have … cat fights. But eventually they find a way to work together and, when escape becomes possible, decide to remain together, living on the island. This is a fun book to read. In addition to math facts, there are delicious puns scattered through the pages. Review copy from my bookshelf. More ... or maybe less? Just like people, some birds collect stuff. Bower birds decorate their bowers with blue things; crows are attracted to shiny things. And magpies? 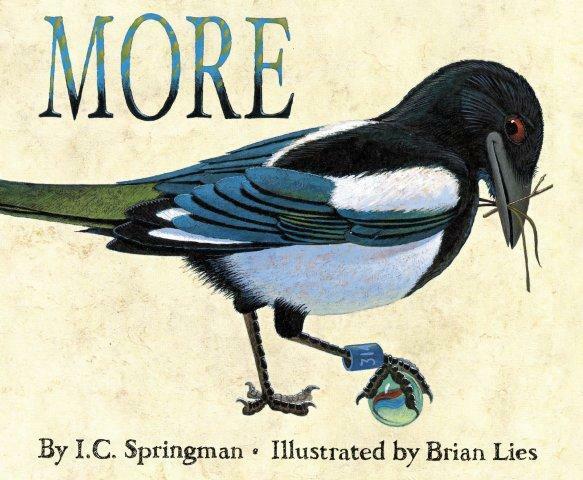 In this book, magpie collects anything and everything. He carries pocket watches, marbles, and keys back to his nest. At some point it becomes “Much too much” … and time for a friendly mouse to intervene. Forty-four words are enough to tell the story about when “more” is more than enough. Coupled with Brian Lies expressive illustrations of an acquisitive magpie, this book clearly illustrates that in some cases, less is more. This is a fun book, and certainly not meant to be taken as fact. Still, when I reached the last page I found myself searching for end notes, an author’s note … anything that might explain why magpies are such pack rats.